The M570 PowerRelay is a complete single phase or three phase multifunction AC power transducer, providing up to three set point relay outputs, one energy relay and an RS485 communication port. 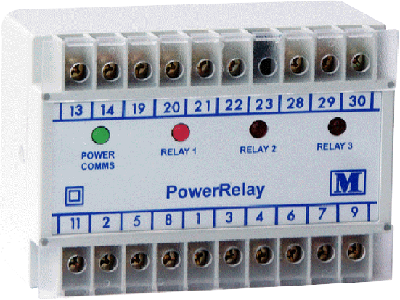 Several of the parameters measured by PowerRelay can be assigned to the set point relays. An option of pulsed output via a relay is offered. The pulsed output can be assigned to W.h, Var.h (import or export), A.h or VA.h. Using the RS485 port and Modbus protocol, all measured quantities can be obtained, the system's parameters can be set up, important data can be saved to computer and the order of the Modbus registers themselves can be changed.